We Know Shipping Sportfishing Yachts! sportfishing yacht moved anywhere in the world. Your sportfishing yacht is an investment and it deserves the best care available when it comes to shipping. There are special issues when hauling a vessel of this size that need to be considered from the beginning, especially regarding dimensions. Yachts are oversized, exceeding the state allowances for transport. At Nationwide Boat Shipping, oversized boat transport is no problem. We have experience in transporting sportfishing yachts and know how to do it properly. 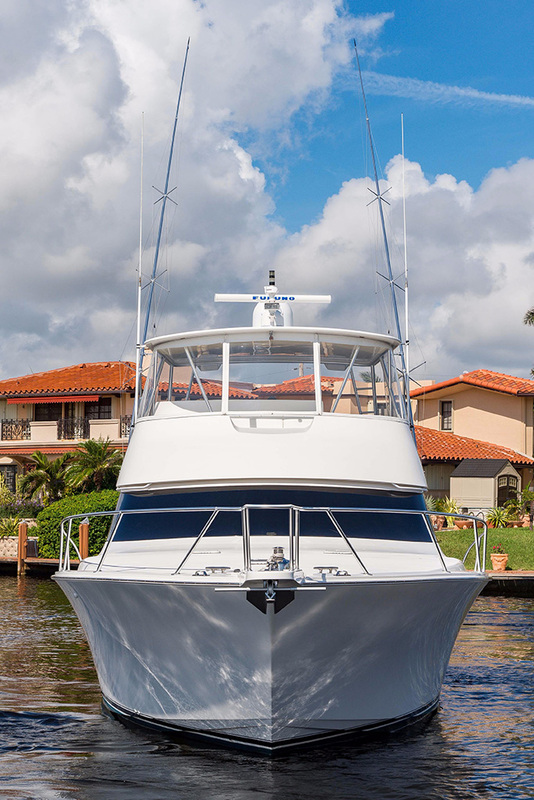 We will treat your yacht with the utmost care, no matter how far we are shipping it, and provide a pole car to travel with your sportfishing yacht transport when needed. Transporting a sportfishing yacht can be very intimidating for the new boat owner. There are more steps to the preparation of shipping a sportfishing yacht than a smaller vessel. For one thing, the size of a yacht makes it automatically more difficult. The height limit is 13'6" in some states and 14' in others; yachts, even after all parts necessary are removed, exceed the normal dimensional limits. Height is also important in the route planning for your yacht transport. The professional transport team at Nationwide Boat Shipping have the experience needed to take care of an oversized boat transport easily. We will take care of getting all needed permits and escorts, too. We can haul sportfishing yachts of all sizes to the destination of your choice and save you the worry. Call (800) 352-8475 to talk with one of our logistics professionals for a free no obligation quote today! Whether you need local sportfishing yacht transport services or long distance, Nationwide Boat Shipping has got you covered. We provide premium sportfishing yacht shipping to every state in the U.S., regardless of the distance. Our yacht shipping specialists have the knowledge and experience necessary to ensure that your vessel arrives safely. And you can stay in continuous contact with your transport team all along the route, so you will always know what is happening with your sportfishing yacht. "To most people their cars are their baby but my sportfishing yacht is mine & Nationwide Boat Shipping did a great job in getting it transported!" "Was worried about getting my fishing yacht shipped to my new residence but Nationwide Boat SHipping took care of every detail! Thanks!" "I don't trust my yacht with anyone but Nationwide Boat Shipping - I'm a repeat customer & have given them many referrals & they always do a great job!"